In my herb-raiding final throws of summer, I scored a MOUNTAIN of fresh basil. I was all like, "PESTO duhhhhhh." I may have actually said that out loud to myself too. Who's a cool cat? And in my unending love for all-things caprese, I thought it would pair wonderfully with tomatoes and goat cheese. Grilled chicken rounded out this simple summer meal. I wasn't kidding... friggin' basil mountains up in here. Only in August can you get such big, leafy beauties. With the help of a food processor or blender, you can pull together this versatile sauce in about one minute flat. Simple ingredients here; just a bit of basil, almond, parmesan, garlic and olive oil. 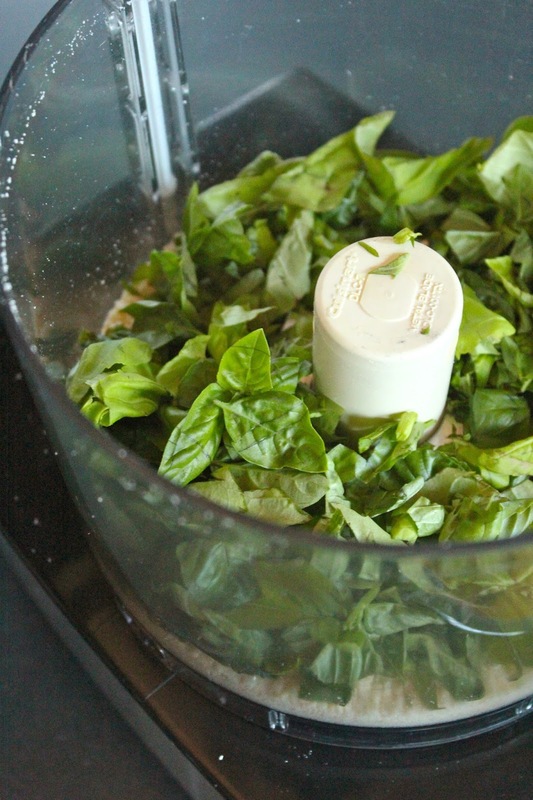 Quickly pulse together the garlic, almond and basil and then run the processor while you stream in the olive oil. 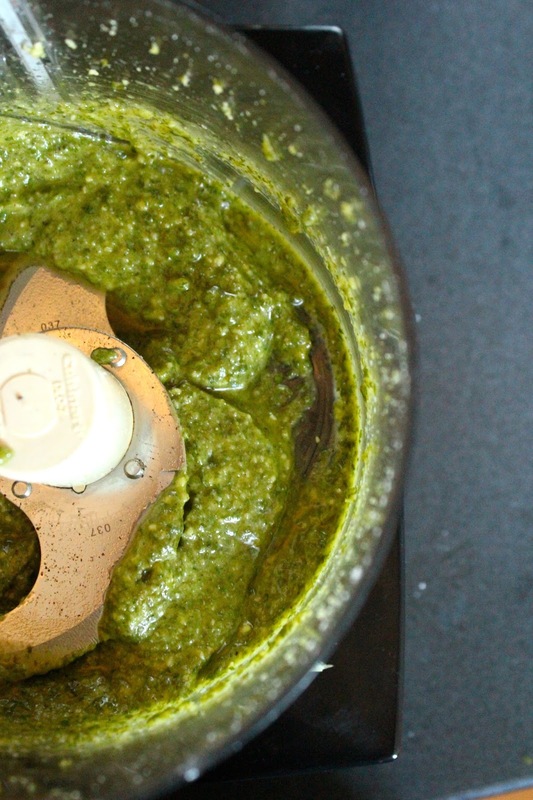 Pesto is a great sauce and marinade. Be sure to reserve a few tablespoons before tossing with raw chicken. Let this hang out for a few hours or overnight, if you can. While you grill the chicken, you can quickly pull your roasted tomatoes together. It's a seriously simple process: slice, top and broil. Roasty, toasty, goaty. The perfect foil to your fresh pesto. Combine basil, almonds, garlic and parmesan in the food processor and pulse just until combined. Run processor and stream in olive oil. Reserve 3-4 tablespoons of pesto. Toss chicken in remaining pesto and refrigerate, covered, for a few hours or overnight. Remove chicken from fridge 30 minutes before beginning cooking. Grill chicken breasts over medium-direct heat for 5-8 minutes per side until internal temperature reaches 160 degrees. Cooking time may vary based on chicken thickness. Allow to rest for at least 5 minutes before slicing or serving. Heat broiler. 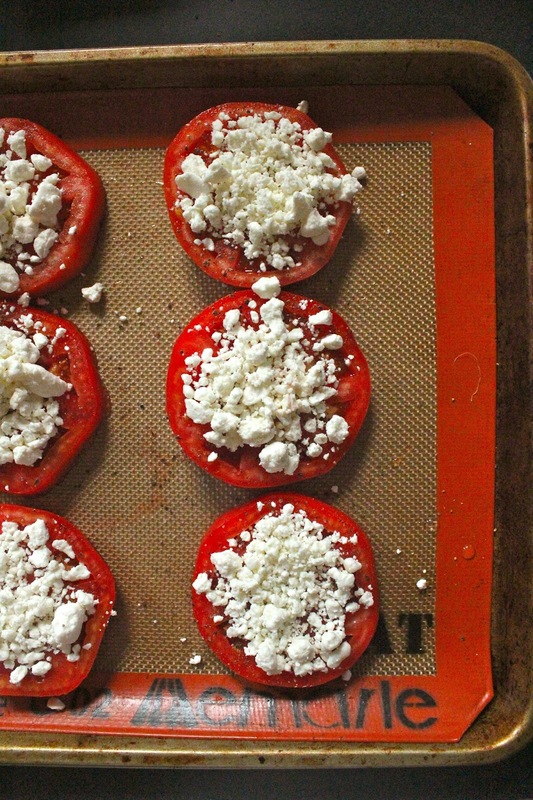 Slice tomatoes and arrange in single layer on a sheet pan. Top with a spoonful of goat cheese crumbles. 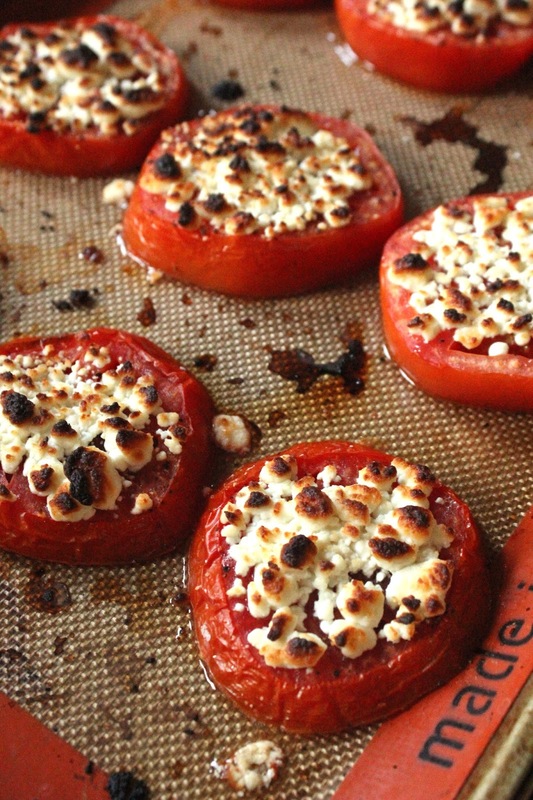 Broil sliced tomatoes until cheese melts. This took about 5 minutes in my oven, but broilers can really vary. 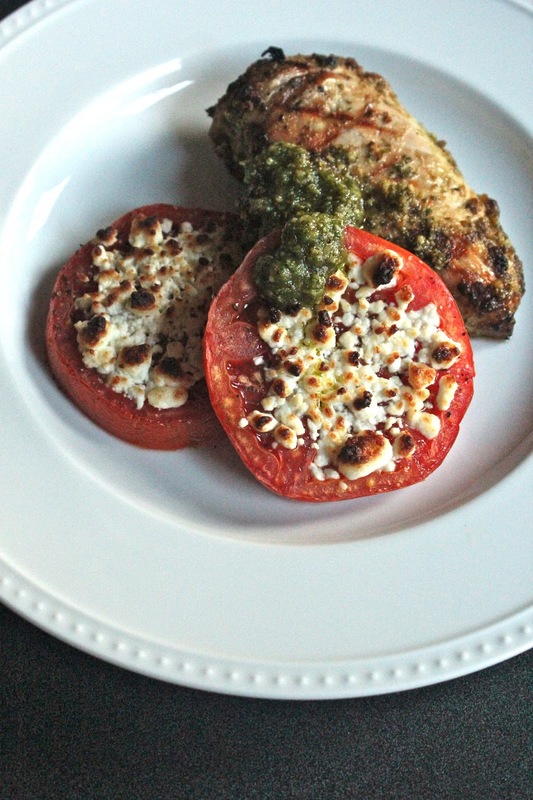 Top tomatoes and chicken with reserved pesto. Enjoy! 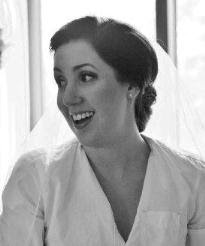 Delicious, Carey. And so easy to make! Especially for a busy mama. I'll definitely repeat the tomatoes in the future! Could be good for amping up wimpy winter tomatoes too.